This is an extremely revealing and important book for protecting, preserving, and promoting the profound and ancient Vedic tradition of India. This book helps remember what the world is forgetting about the terrible things done to India and its people by its invaders. India is a most resilient country, and is presently becoming a great economic power in the world. It also has one of the oldest and dynamic cultures the world has ever known, but few people seem to understand the many trials and difficulties that the country has faced, or the present problems India is still forced to deal with in preserving the culture of the majority Hindus who live in the country. This is described in the real history of the country, which a decreasing number of people seem to recall. Therefore, this book is to honor the efforts that have been shown by those in the past who fought and worked to protect India and its culture, and to help preserve India as the homeland of a living and dynamic Vedic tradition of Sanatana-dharma (the eternal path of duty, wisdom, and spiritual development). There are also many people who do not know of the many angles and ways in which this profound heritage is being attacked and threatened today, and what we can do about it. There is much to do to protect this culture, and until we are aware of how it has been assaulted in the past, and how it is threatened in the present, we will not have the motivation to take a stand and defend it for its future. · How there is presently a war against Hinduism and its yoga culture. · The weaknesses of India that allowed invaders to conquer her. · Lessons from India’s real history that should not be forgotten. · The atrocities committed by the Muslim invaders, and how they tried to destroy Vedic culture and its many temples, and slaughtered thousands of Indian Hindus. · How the British viciously exploited India and its people for its resources. · How the cruelest of all Christian Inquisitions in Goa tortured and killed thousands of Hindus. · Action plans for preserving and strengthening Vedic India today. 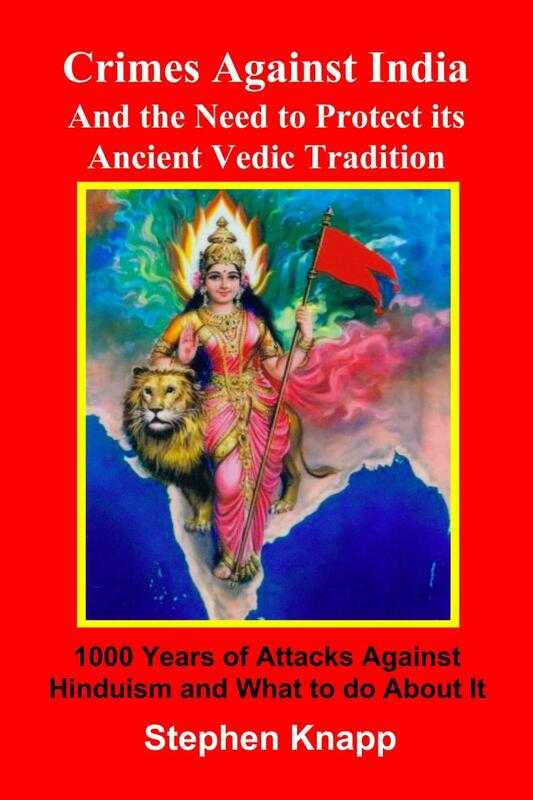 · How all Hindus and concerned people must stand up and be strong for protecting the universal spiritual traditions of Vedic culture. In the darkest of eras that this world has seen and will see in the future, the Vedic tradition, the culture of yoga, will remain India’s gift to the people who inhabit this planet. It is this spiritual culture of Sanatana-dharma that remains the spiritual guide of humanity. This is the reason why India is here, and for the contribution that she makes, and the reason why we must work to protect it. Hinduism remains the most attacked and under siege of all the major world religions. This is in spite of the fact that Hinduism is the most tolerant, pluralistic and synthetic of the world’s major religions. Hindu gurus have more than any other religious teachers in the world tried to find an underlying unity of religion to create peace in humanity. Yet though Hindu gurus have called for respect for all religions, leaders of other religions have not responded in kind by offering any respect for Hinduism. Instead they have continued to promote their missionary agendas and plan the conversion of India to their beliefs. Why is Hinduism still so much a target of missionaries and the media? It is really very simple. Hinduism is the largest of the non-conversion, non-proselytizing religions and so offers the greatest possibilities for conversion. It is the vulnerability of Hinduism that makes it a target, not the fact that Hindus are trying to convert or conquer the world for some hostile belief. After Christianity and Islam, Hinduism is the world’s largest religion and the largest of the non-Biblical traditions. India, where most Hindus reside, has the most open laws allowing in foreign religious groups. While missionaries are virtually banned in China and in Islamic countries, in India they are often tolerated, respected and given a wide scope of activity. Since Christianity is in decline, particularly in Europe, it has a need to find new converts for which India is one of main potential locations, particularly as a comparatively high percentage of Hindu converts are willing to become priests and nuns. Pope John Paul II in a trip to India some ten years ago spoke directly of looking for a ‘rich harvest of souls in the third millennium in Asia’, specifically India. Yet most Hindus and groups sympathetic to them are not aware of this ‘siege on Hinduism’ that continues unrelenting as part of the multi-national missionary business. In this context, the book of Stephen Knapp, Crimes Against India: and the Need to Protect its Ancient Vedic Tradition, is very timely, well written and well documented. The siege on Hinduism has been going on since the first Islamic armies and Christian missionaries entered India as he clearly delineates and has continued in various forms, violent, subversive or even charitably based. While people know the history of the genocide of the Jews by the Nazis, the greater and longer genocide of Hindus by Islamic invaders is hardly noticed. Even the genocide in the Bangladesh War of 1971, in which most of the several million killed were Hindus, is not acknowledged as a religious genocide. While people know the history of the Inquisition and the burning of witches in Europe and the genocide of Native Americans by Christian invaders, they don’t realize that India has a similar history in parts of the country like Goa. Knapp fills in these gaps and makes these connections. More importantly, people don’t realize that questionable conversion tactics are still being used in India today, where in the South, the rate offered for conversion is around twenty thousand rupies, going up and down with the economy! They also don’t realize that it is now American Evangelicals of the Jerry Falwell and Pat Robertson line – the religious right that brought George Bush to power – that is spearheading conversion activity and church building in South India, pouring billions into the country. Yet Knapp’s book is not just written to make us aware of this assault on Hinduism and its many dangers. He also provides a way forward, showing how Hindu Dharma can be revived, better taught, better communicated and more widely shared with the global audience, which is becoming progressively more receptive to Hindu teachings of Yoga, Vedanta and respect for nature. He documents the Hindu renaissance and the modern Hindu movement, which though small is growing rapidly as a Hindu response to this denigration of its venerable traditions. He shows that Hindus are not responding in terms of becoming another intolerant, exclusivist missionary cult. They are organizing themselves in terms of teaching, service and spiritual practices. The book is well worth reading and will show any open minded person the Hindu side of a millennial debate on religion that has so far largely excluded the Hindu point of view. That Knapp is a western born Hindu adds to his credibility and conviction. He is not simply defending a tradition handed down by his family or his culture, but one that he has embraced from deep spiritual conviction and profound inner experience. One hopes that readers in India will listen to his voice and that those outside of the country will recognize the Hindu plight along with the other forms of oppression going on in the world. Religious minorities at a global level are still under the assault of religious majorities, which have long been armed with petrodollars, high technology and control of the media. Yet as the book demonstrates, the tide is beginning to turn. Casteism: Is It the Scourge of Hinduism, or the Perversion of a Legitimate Vedic System? PAPERBACK: $19.95, Size: 6" x 9", 392 pages, ISBN-10: 1721974881, ISBN-13: 978-1721974887. AVAILABLE AS PAPERBACK OR KINDLE EBOOK AT ALL AMAZON LOCATIONS IN LOCAL CURRENCIES.